If this doesn't make sense, its been too long since you guys have spent time in Flagstaff. Plenty of redneck outdoor types here. Nuke and eat, what better way to consume "nearly a pound of hunger-stompin goodness." 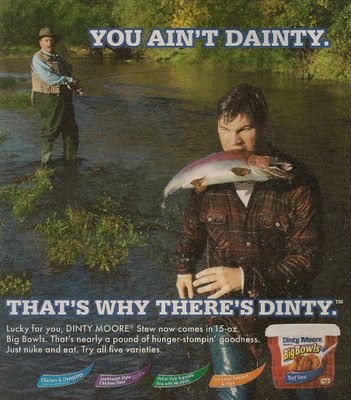 Looks to me like a near pound of Dinty Moore goodness is a heck of a lot more appetizing than the raw fish he's about to consume.